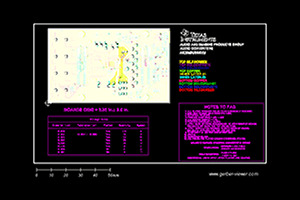 The circuit represents a high-performance data acquisition (DAQ) solution suitable for processing input signals (up to ±12 V) superimposed on large common-mode offsets (tested up to 155 Vp-p from dc to approximately 15 kHz) relative to the ground potential of the system's main power supply. 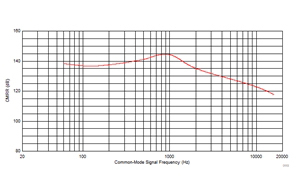 Common-mode rejection is achieved by generating an isolated power supply to allow the analog signal chain to float with the input common-mode signal. 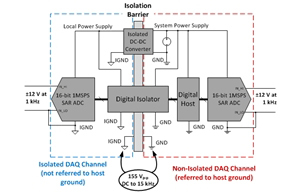 The analog signal chain consists of a high-performance, 16-bit, 1-MSPS SAR ADC with an integrated analog front end (AFE) that offers high input impedance and a wide ±12-V input voltage range. Relevant application areas include PLC analog input modules with channel-to-channel isolation, automotive battery pack monitoring, power monitoring in AC motor drives and thermocouple measurements.